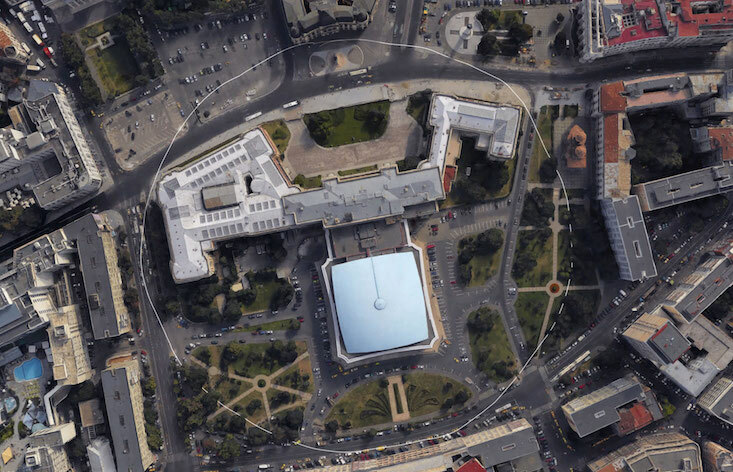 A a thick white line tracing a path around Romania's National Museum of Art has appeared in Bucharest. Created by American artist Andrew Herzog, the epic undertaking, Circle or Curve?, appeared as part of this year’s Unfinished Festival. Still in awe that we managed to pulled it off. Thanks again you to Romania. Thank you to everyone at @unfinishedfestival. Thank you to Floriana Sandu. Thank you to @ramonatodoca. Thank you to @lxmuresan @vasilismarlantis @davidvoiculescu @gabriel.burcea @ioana.petresco and everyone else that came out yesterday morning. Visible in its entirety only from the sky, the mural pushes visitors to tread the same path as the artist in a bid to work out how far they’ve travelled, where they are, or if the mural is a circle at all. Each viewer is forced to rely on their own imagination to picture the work as a whole — questioning the link between artist and visitor in the creation of the artwork. Herzog hopes that the mural’s home in the heart of the city will engage people across Bucharest, rather than typical art goers. But the mural won’t be there for long: the paint is designed to be washed away by the rain and under the shoes of passersby.